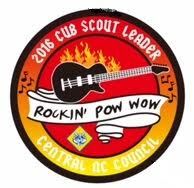 2016 Cub Scout Leader Rockin' Pow Wow - Saturday, January 30th - 8am to 3:30pm Badin Elementary in Badin, NC - Learn tips to have Jammin' unit events and make your packs ROCK!!! Late fee: After 1/23/2016 a fee of $5.00 will apply. Recruiting New Leaders - It's never too early to identify and start training your replacement. It brings continuity and longevity to a Pack, but the new leader is more likely to succeed. Online Advacement/Service Project Recording - Show how easy it is to record advancements online with the use of the classroom smartboard or laptop. Periodic advancement is a great way to reward the Scouts on their progress and basic advancement emblems are free! Advanced Training - Why should you BALOO? Learn more about the importance and benefits of BALOO, Outdoor Leader Skills, WoodBadge, Powderhorn and other great learning opportunities available throughout the year. Local Outings and Tour Forms - Identify for leaders 2-3 destinations in each District that are free/low cost and offer Scouts a chance to earn achievement requirements and have fun as a Pack. Beyond the Badge - Religious Emblems, Outdoor Ethics and other awards - Teaching leaders about some of the extra awards available in Cub Scouting, their value, and how to incorporate them into your Scouting year. Cub Scout Science - Use Cub Scout curiousity to learn more about science. Hands-on activities and experiments. Learn all about the STEM-Nova programs. Council Events & Outdoor Facilities - A review of the annual events the Council offers for Cub Scouts and how they can be a good resource to leaders, including information about Camp John J. Barnhardt and other Boy Scout camping areas in the Council. Intro to Camping - Teach why it is important to get boys and their families outdoors. Review camping essentials for Cub Scouts. Review camping etiquette and the importance of BALOO training. Outdoor Cooking & Campfires aka "Lords of Heavy Metal" - Ideas for tasty, easy dinners you can cook with your Cubs, and how to plan and execute the campfire later that night. Finances in the Pack - Organizing suggestions that are quick, easy, and sustainable to allow a Pack to keep clear and accurate historical records and financial reports for the unit. Basic First-Aid - basic first aid every leader should know and what should be on hand at every meeting and outing. Youth Recruitment and Retention - Beyond flyers and handouts - ways to keep your pack growing. All Means All- How to help Scouts with learning, health and behavioral challenges - including identification, interaction and communication/cooperation with the Scout's adult partner. Learn how to include Cub Scouts with special needs while making it safe and fun for all. What About Webelos? 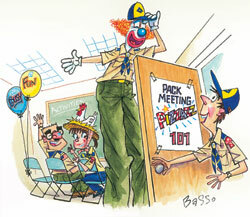 Helping Scouts (and their parents) make the transition into Webelos from the perspective of a Boy Scout Leader. Session 5 - 2:15-3:00pm - These will be Roundtable sessions designed to bring like-minded leaders together to discuss topics and share ideas specific to your rank.